When it gets a little hotter in Ottery. 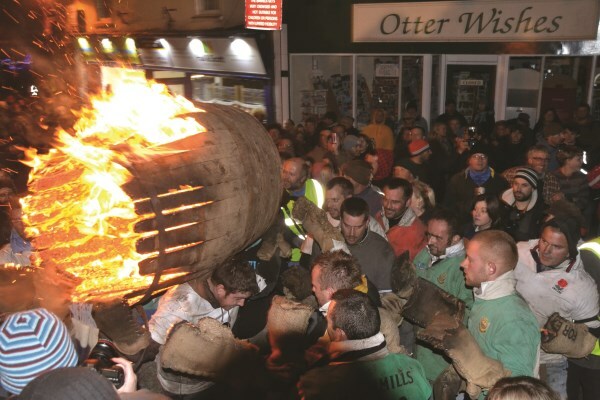 As far as bonfire nights are concerned, the one at Ottery St Mary this week, near our Kings Reach location in the heart of Devon, is something of a spectacular! This is an historic event that begins with the age-old tradition of lighting tar barrels, which are then carried through the streets by local people to the square. The evening concludes with a 30ft high, 50ft wide bonfire and a fireworks display. Ever mindful of the importance of health and safety on such occasions, Bovis Homes South West region are sponsoring the crowd marshalling equipment at the event, including the hi-viz jackets, as well as providing lighting and herras fencing.